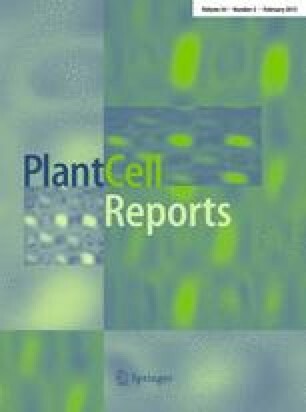 Agrobacterium tumefaciens caused tissue browning leading to subsequent cell death in plant transformation and novel anti-oxidative compounds enhanced Agrobacterium -mediated plant transformation by mitigating oxidative stress. Browning and death of cells transformed with Agrobacterium tumefaciens is a long-standing and high impact problem in plant transformation and the agricultural biotechnology industry, severely limiting the production of transgenic plants. Using our tomato cv. MicroTom transformation system, we demonstrated that Agrobacterium caused tissue browning (TB) leading to subsequent cell death by our correlation study. Without an antioxidant (lipoic acid, LA) TB was severe and associated with high levels of GUS transient expression and low stable transformation frequency (STF). LA addition shifted the curve in that most TB was intermediate and associated with the highest levels of GUS transient expression and STF. We evaluated 18 novel anti-oxidative compounds for their potential to enhance Agrobacterium-mediated transformation, by screening for TB reduction and monitoring GUS transient expression. Promising compounds were further evaluated for their effect on MicroTom and soybean STF. Among twelve non-antioxidant compounds, seven and five significantly (P < 0.05) reduced TB and increased STF, respectively. Among six antioxidants four of them significantly reduced TB and five of them significantly increased STF. The most efficient compound found to increase STF was melatonin (MEL, an antioxidant). Optimal concentrations and stages to use MEL in transformation were determined, and Southern blot analysis showed that T-DNA integration was not affected by MEL. The ability of diverse compounds with different anti-oxidative mechanisms can reduce Agrobacterium-mediated TB and increase STF, strongly supporting that oxidative stress is an important limiting factor in Agrobacterium-mediated transformation and the limiting factor can be controlled by these compounds at different levels. Funding for this project was provided by Syngenta Biotechnology, Inc. The authors would like to thank Drs. Liang Shi and Thomas Chenier from Syngenta Biotechnology, Inc., and Drs. Timothy Hawkes, Eric Clarke from Syngenta Jealott´s Hill International Research Centre for technical assistance and stimulating discussions. We gratefully acknowledge the contribution of Drs. Shujie Dong and John Ke from Syngenta Biotechnology, Inc. in critically reviewing this manuscript.